2017 was another busy year for the Pink Gorilla. He turned 10 after-all. Not just our company, but yes, the same Pink Gorilla costume has been used to start all our events since the inaugural Market to Market Relay in 2008. At Pink Gorilla Events, it is part of our DNA to serve up something a little special for our participants while also making a positive impact in the communities in which we operate. We love seeking epic experiences ourselves and doing whatever it takes to follow the golden rule by going above and beyond to build respect with participants, volunteers, vendors, and communities. Ultimately our goal is to create fun, by producing Big Experiences for runners, but we couldn’t do that without a team dedicated to those core values. As we turn the page on 2017 and look ahead to what is sure to be an exciting 2018, we thought it would be fun to compile some of the numbers it took to produce 8 Big Experiences in 3 states in 2017. As eluded to above, we celebrated the 10th Anniversary of what is now the largest single day running relay in the world, in Market to Market Relay Nebraska. This year’s event saw a record 634 teams take on the running road trip from Omaha to Lincoln. And we had 94 runners and our presenting sponsor OrthoNebraska celebrate their 10th time participating in the event! 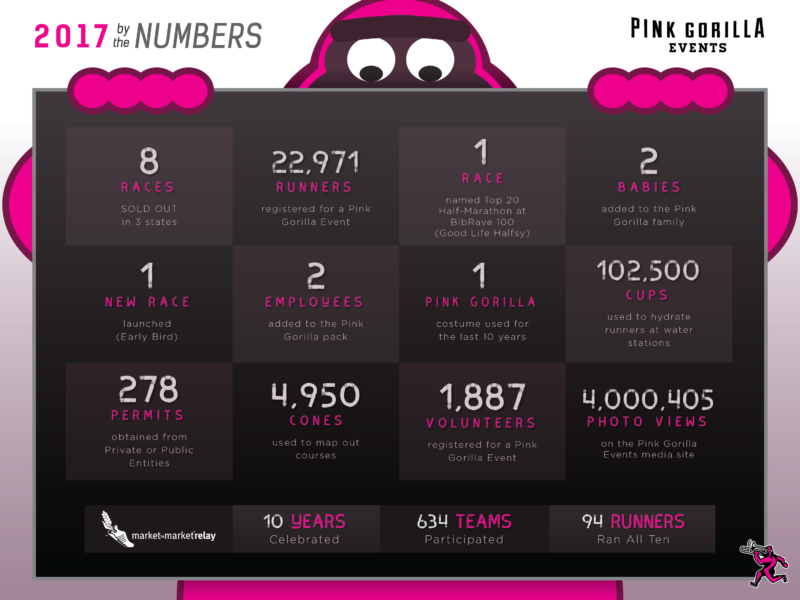 In total, Pink Gorilla Events had a record 22,971 registered runners from 48 states across our 8 events, all of which sold out. We worked with 1,887 volunteers, placed 4950 cones on our courses, used 102,500 cups at our aid stations, and obtained 278 permits from private or public entities to make our events a reality! Of course, race day logistics isn’t the only thing that plays into producing big experiences; we had 4,000,405 photo views of our free race photos and had 23,459 photos taken at the Good Life Halfsy alone! The Halfsy was also named to the Top 20 Half-Marathons by BibRave 100! We also had a record number of 491 runners complete the BRIN BLACKOUT, by finishing all three 10K’s in the BRIN Running Series. 2 new Pink Gorilla babies were born! No, this wasn’t a genetic abnormality. Two of our owners, Jared Bakewell and Zach Harsin both welcomed baby girls into their respective families. 1 new event launched, we launched the Early Bird 10 Mile Run in December and the inaugural event is set for March 31, 2018! 2 new employees join our team. We hired Maddie Haden as our Customer Service and Warehouse Specialist and Julie Groeteke as our Community Relations Manager in Des Moines. Thank you for being a part of this success! None of this would be possible without the support of those local groups, loyal runners, or our amazing sponsors. So thank you to everyone who had a role in making 2017 one for the history books. We look forward to an even more exciting 2018!